The East Rand region of Gauteng encompasses the towns Alberton, Benoni, Boksburg, Edenvale, Germiston, Brakpan, Nigel and Springs and their surrounding areas. Also included in this region are Kempton Park and the Johannesburg International Airport. All of the aforementioned towns, each of which used to be a separate municipality, have been incorporated into the new Ekurhuleni Metropolitan Municipality. The whole area has grown and developed as a direct result of the discovery of gold in the area, though Springs was founded after the discovery of coal. The East Rand is now an extremely important region in terms of the economics of Gauteng. The town of Kempton Park owes its growth and development to its proximity to the Johannesburg International Airport. The Airport is South Africa's main point of entry, and from it extends a network of highways that link to all the major cities of the country. Johannesburg International Airport is the most modern airport in the whole of Africa. For followers of horse racing Gauteng boasts three racecourses, and two of them are located in the East Rand, one is Newmarket Racecourse in Alberton and the other Gosforth Park in Germiston. There are plenty of other outdoor activities to be found in the East Rand though. One very popular venue is Wild Waters, a water park which carries a number of thrilling activities including a wave pool and water slides. In and around Benoni you can visit a honey farm, a koi farm, and a favourite venue for the kids is the Bunny Park, a home not only to numerous rabbits, but also to other farmyard animals including goats, cattle, sheep, pigs and donkeys. Situated between Edenvale and Boksburg is the East Rand Mall, one of the most prestigious malls of the whole of Gauteng, with its nine cinemas, five banks, thirty fashion shops and numerous restaurants and fast food outlets. A great number of specialist super stores have sprung up in the immediate vicinity of the East Rand Mall, so when visiting the sports super store, for example, you can be assured of finding just what piece of equipment you are looking for. Bargain hunters will prefer the adjacent East Rand Flea Market. Close to Edenvale in the East Rand you can find the Franz Hoernig Haus. Built in 1894 as a residence for the original manager of a dynamite factory, this is one of the oldest surviving buildings of the 19th Century. That small dynamite factory grew into the largest explosives factory on the African Continent at Modderfontein. The factory is now surrounded by an 8000 hectare conservation park that is home to the Cape Otter, the grey duiker, steenbok, black-backed jackal and red hartebeest as well as zebra, springbok and more than 200 bird species. At Germiston in the East Rand there is the Germiston Lake where school eights, quads, double and single skulls from many Johannesburg schools can be seen practicing on a daily basis. 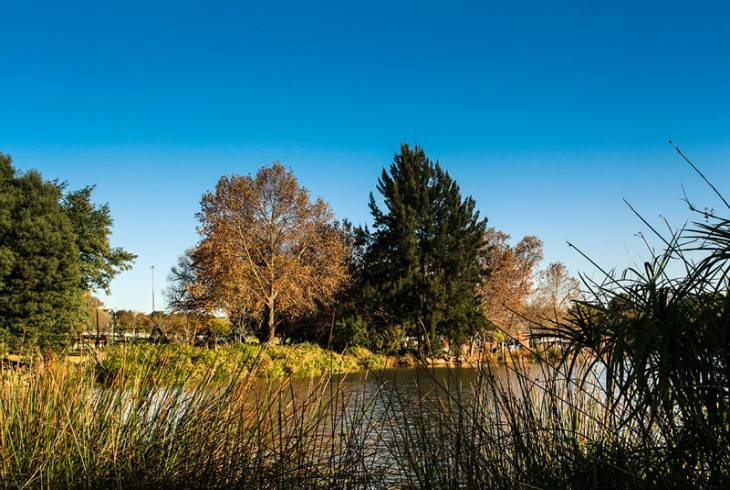 The lake is surrounded by a large park and is a favourite venue for weekend picnics and braais. Germiston also is home to the Rand Airport, a general aviation airport that supplements Gautengs other airports. The town of Springs in the East Rand is to be found in the south-eastern part of the region. Springs sprung up in 1904 and owes its origins to the discovery of coal and gold in the region. It has developed from a pioneering mining town into a prosperous industrial giant. Just outside of Springs is the Blesbokspruit Wetland Reserve. Blesbokspruit is Gauteng's major wetland system, running through Kempton Park, Boksburg, Brakpan, Springs and Nigel, and on to Heidelburg where it flows into the Suikerbosrand River. Within the Springs section alone there are more than 250 species of bird. Brakpan is also the location of the new Carnival City Casino. To summarise, the East Rand is an important ecological and economic region and one that should not be missed by any visitor to South Africa. Ekurhuleni - East Rand Accommodation and Information. Ekurhuleni - East Rand, Gauteng.